As the 2018 Camp Adventure! sessions conclude, The Foundation receives profound feedback from campers, parents, volunteers, and counselors. We would like to thank all of our sponsors and partners who helped make the sessions happen. We spotlight the Houston Symphony, through Emily Nelson, Associate Director of Edcation & Community Programming. Why is it important for Houston Symphony to partner with literacy programs like Camp Adventure!? How does the Symphony incorporate literacy into music sessions? The Community-Embedded Musicians use curriculum designed to forward literacy skill development through music. Songs they teach the children are designed to develop children’s attention control, phonological awareness, new vocabulary, and expressive language. Rhythm and movement activities help the children develop motor skills and ability to cross the midline, which influence brain development and literacy learning. The Community-Embedded Musicians see each K-2nd grade cabin every day. On the final day of both camps, Community-Embedded Musicians present a concert for all K-2nd grade where the children have the opportunity to sing their favorite songs from the sessions along with the ensemble. What do you hope students will learn from their experiences with the Community-Embedded Musicians? We hope that the children have learned skills that will help them succeed in school and in life. In addition to the literacy skills targeted through the curriculum, we believe the experience with the Community-Embedded Musicians provides the students with opportunities to develop social-emotional skills, which are also essential for success in life. Music has a tremendous power to excite and engage. We hope that, from their experiences with the Community-Embedded Musicians, the children will be inspired to read, to learn, and maybe even play an instrument in their school music programs. What is your favorite Houston Symphony memory of or activity with the campers? It has been a joy to watch the final concerts and see 100% of the students fully engaged and singing their new favorite song, “She Sells Sea Shells”! The children mastered the lyrics and hand motions and could even sing the song in rounds. Watching the counselors actively participate has been special as well, because the counselors are able to extend the music in their cabins all through the day during the camp, not just in our sessions. I loved seeing one counselor lead the students in choruses of the Symphony songs before the final concert, because it was a testament that the music continued to engage the campers even after our Community-Embedded Musicians left for the day! We have always been told that volunteering is something that is good to do. But did you know that scientific evidence supports the benefits of volunteering? For years, researchers have been looking at how giving your time to a cause can help positively influence your life. Volunteering offers vital help to people in need through worthwhile causes in the community, but the benefits can be even greater for you. 76% of people who volunteered in the last twelve months said that volunteering has made them feel healthier. 94% of volunteers said that giving their time to a cause improved their mood. 78% of volunteers said that it lowered their stress levels. 96% reported that volunteering increased their sense of purpose in life. My mom is fondly known as the "First Lady of Literacy." She has been a champion for the literacy cause across the country for nearly three decades while in the White House and subsequently through her national organization, the Barbara Bush Foundation for Family Literacy. Barbara Bush has always understood that learning begins and is reinforced at home with parents being the child's first and most important teachers. Although we didn't directly discuss the topic of literacy in our home while growing up, Mom created an environment in our house that valued, fostered, and modeled strong literacy development for my siblings and me. She frequently read to us, spoke to us using words that developed early vocabulary, and encouraged us to speak what was on our minds in clear sentences and to always write thank-you notes. Having strong parental engagement in the learning and development of a child has always been a priority and focus of my mother in our home, as First Lady of the United States, and throughout her life. Mom's national foundation has supported family literacy programs in all fifty states, because she realizes that low literacy is intergenerational and that breaking the cycle of low literacy requires a focus on family literacy. 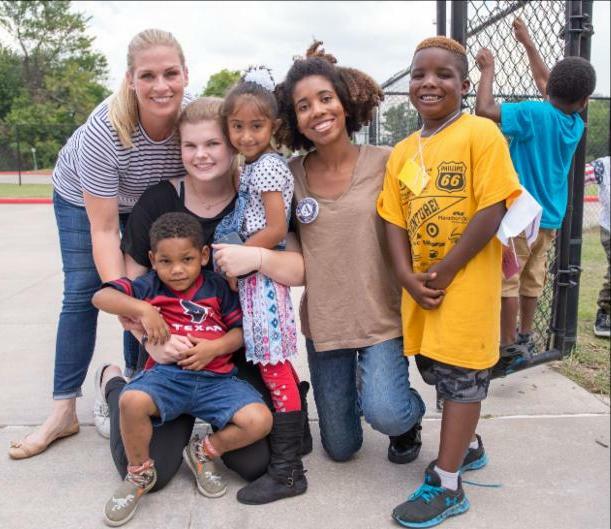 When Maria and I formed the Barbara Bush Houston Literacy Foundation four years ago, we were intent on leveraging Mom's legacy in literacy in her backyard by bringing the community together to solve our city's literacy crisis and to raise awareness of the critical importance of developing age-appropriate literacy skills. Everyone deserves to have the right to learn how to read and to reach his/her fullest potential in life. In the wealthiest country in the world, it is a travesty that 36 million Americans are functionally illiterate. My Mom says that if more people could read, write and comprehend, many of our problems as a nation would be solved or at least well on their way to being addressed. Literacy is such a foundational skill that her belief makes simple sense. Houston is the perfect city to address the literacy crisis, and I am proud that the Barbara Bush Houston Literacy Foundation is playing an important role as a catalyst for change. The coalitions that are working area- wide and in specific neighborhoods are engaging thousands of change-makers in raising awareness and implementing strategies that will raise literacy rates across the board. We will consider our work done when every mother of a newborn baby understands the importance of raising a brain-stimulated, literate child and has strategies to do so. Our work will be done when every family embraces a culture of reading and communication and when every elementary school implements systems to establish a culture of early literacy success. To accomplish this we need an army of volunteers to step up to add capacity to vital services being provided by hundreds of organizations helping develop literacy skills for people across the entire age spectrum. I know this great community will rise to the challenge. Neil and Maria Bush stand alongside Mayor Turner and representatives from: Houston City Council, Phillips 66, Robert and Janice McNair Educational Foundation, Houston Public Library Foundation, and Renovation Houston. Mayor Turner also unveiled architectural renderings for major renovations for the plaza and kicked of the capital campaign to raise $5.5M through the Houston Public Library Foundation to pay for the effort. A focal point connecting Houston’s Main Library and the historic Julia Ideson building, the Barbara Bush Literacy Plaza will include a performance stage, an Internet café, an adult reading garden, an outdoor children’s reading room, and more. Many nonprofit organizations struggle with the skill and resources for implementing a successful public relations campaign. As a result, they receive little to no press coverage about their organization, programs and special events. In her “Dancing with the Media” presentation, Barbara Bush Houston Literacy Foundation’s CCO, Tiffaney Hunter, shares step-by-step ways for creating eye-catching marketing pieces and attention-grabbing press materials that will have nonprofit organizations Fox-Trotting and Cha-Chaing all the way to their next media interviews! Check out these awesome Christmas books for your and your children to read. Some of these books will bring back great childhood memories for you and will start new memories for your child. How wonderful is that?! We hope you all have a very Merry Christmas! Incredible learning experience. Coming in as my first day as an intern with the Barbara Bush Houston Literacy Foundation, I was immediately thrusted into taking pictures of volunteers, running around to each classroom getting photo ops, and just soaking the ever-amazing energy of children learning. I was extremely excited and astounded by these well-behaved kids that looked engaged and excited to be there. The whole event seemed to go off without a hitch at Poe Elementary, which I later learned was months and months of preparation and planning from the Foundation as well as other organizations of which I am positive. Read Across the Globe was an event sponsored by the partnerships of the Barbara Bush Houston Literacy Foundation, Deloitte, Points of Light and Volunteer Houston. The literacy crisis in Houston is what drove the community to help and volunteer by reading to children on this day and is also why they volunteer their time throughout the year to read to kids. The movement, “Literacy by 3 is HISD’s way to end the literacy crisis in Houston…” (houstonisd.org), which does not only involve the teachers in our schools, but parents, friends, and our community. We all need to help in order to end the literacy crisis. During the post event press conference, our speakers which included Co-founder of Barbara Bush Houston Literacy Foundation Neil Bush, our President, Julie Baker Finck, Anne Taylor of Deloitte, and Poe Elementary Principal, Jeff Amerson. Mr. Neil Bush noted in his press conference that each 3rd grader should be reading at grade level and there are many students who do not. It doesn’t take a scholar to see why these wonderful organizations sponsored this incredible event as a jump start to fix our literacy problem. Some may question, “Why 3rd grade?” Students should be completely literate by 3rd grade in order to set the precedence for the rest of their scholastic career. If kids are not ready by 3rd grade, they have a better chance of not earning their undergrad and of not meeting or exceeding their potential. We want our young children to be completely literate because as Anne Taylor noted, “today’s kids become tomorrow’s employees”.